NEWARK, New Jersey, May 1, 2012 (ENS) – The Hess oil company has agreed to pay an $850,000 civil penalty and spend more than $45 million in new pollution controls to resolve Clean Air Act violations at its refinery in Port Reading, New Jersey. The settlement requires new and upgraded pollution controls, more stringent emission limits, and aggressive monitoring, leak detection and repair practices to reduce emissions from refinery equipment and processing units. The Port Reading refinery, 10 miles from New York City, where Hess has its headquarters, processes residual fuel oil and vacuum gas oil. The refinery has a production capacity of 70,000 barrels per day and transports its products to market by truck, ship, barge, rail, and pipeline. The government’s complaint, filed on April 19, alleged that the company made modifications to its refinery that increased emissions without first obtaining pre-construction permits and installing required pollution control equipment. The Clean Air Act requires major sources of air pollution to obtain these permits before making changes that would result in a significant emissions increase of any pollutant. Once fully implemented, the controls required by the settlement are estimated to reduce emissions of nitrogen oxides by 181 tons per year and also reduce volatile organic compounds. High concentrations of NOx and VOCs, components of smog, can contribute to childhood asthma. 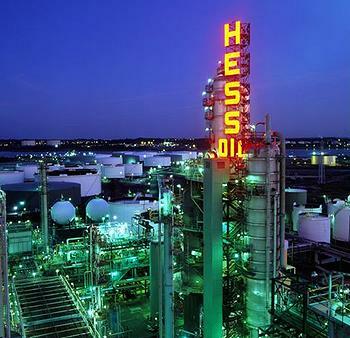 The state of New Jersey actively participated in the settlement with Hess and will receive half of the $850,000 civil penalty. In addition to installing new and improved pollution-control technology at its refinery, Hess also has agreed to more diligently monitor its operation, improve emissions leak detection and repair practices, and to develop stricter emissions limits. That should result in reduced emissions of particulates, carbon monoxide, nitrogen oxides, sulfur dioxide, benzene waste gases, volatile organic compounds, and flaring of acid gases, said Martin. Signed on April 25, this settlement brings the number of refineries under judicially enforceable agreements to significantly reduce emissions of pollutants to 108 refineries operating in 32 states and territories. They total more than 90 percent of the total refining capacity in the United States. As a result of the settlement agreements with the U.S. government, refiners have agreed to invest more than $6 billion in new pollution controls designed to reduce emissions of sulfur dioxide, nitrogen dioxide and other pollutants by over 360,000 tons per year. Hess did not admit liability in the consent decree, which requires court approval after a 30 day comment period.